When I talk to non-fishermen about a few of the intricacies of the fishing world, they’re always surprised at just how much fishing entails. From moon phases to water clarity and everything in between, there’s a lot for anglers to remember if they want to catch fish. Many anglers claim to be well-springs of fishing knowledge, while others swear by their own tried-and-true secrets and tactics when it comes to hooking into bass. Well, we’re here to test your fishing knowledge with a quiz on bass fishing that’s sure to stump even the most seasoned angler. 1. Do bass tend to grow larger in the North or in the South? 2. The modern bass boat entered the fishing world in 1948. What company created this revolutionary watercraft? 3. Manabu Kurita recently tied the world record for biggest largemouth bass. Who does he share the record with? 5. We know bass can see colors, but which of these colors are they more attentive to than others? 6. There are striped bass and white bass, but what do you get when you cross the two species? 7. 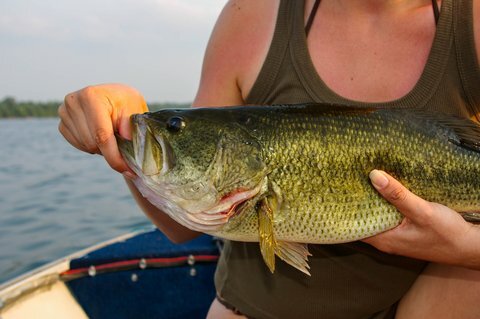 Bass can hear and see and taste, but they’re also well-known for having a “sixth sense,” known as what? 8. During which time of the season are topwater lures known to be most effective?